Nearly a month on, the flood waters have receded. But in some ways, these countries' problems are just beginning. That's because floods always increase the risk of major health problems in affected populations during the weeks and months that follow the actual event. The countries' governments and international aid agencies are coordinating relief efforts. It's important that these don't just focus on the short-term effects of Idai and the floods – it's crucial to look ahead and try to guard against major health crises. There isn't enough safe drinking water; sewerage systems overflow and contaminate drinking supply; and people's hygiene and sanitation suffer in the aftermath of any natural disaster. This increases the risk of diseases that target the intestines, like gastroenteritis and cholera. Cholera had already been reported in central Mozambique before Idai. It will only get worse: by 8 April, more than 3500 cases and three deaths had been reported. Mosquito-borne diseases like malaria and dengue are always present in Beira and surrounds. But more cases are likely to occur after flooding because of increased numbers of mosquitoes. And they're tough to control in these circumstances. Spraying homes isn't possible – homes have been badly damaged or almost entirely destroyed. Emergency coordination centres have been established in Maputo and Beira. These are focused on people's immediate needs: rescue operations, the provision of safe drinking water, emergency shelters, food, restoration of communication channels and transport networks. The United Nations' water, sanitation and hygiene programme is providing safe water, installing latrines, coordinating waste management and educating people about the necessity of hygiene despite the tough circumstances. Approximately 900 000 doses of the oral cholera vaccine were flown into Beira from the World Health Organisation's global strategic supply. Teams have started vaccinating vulnerable people in Beira, and are planning outreach to other areas. 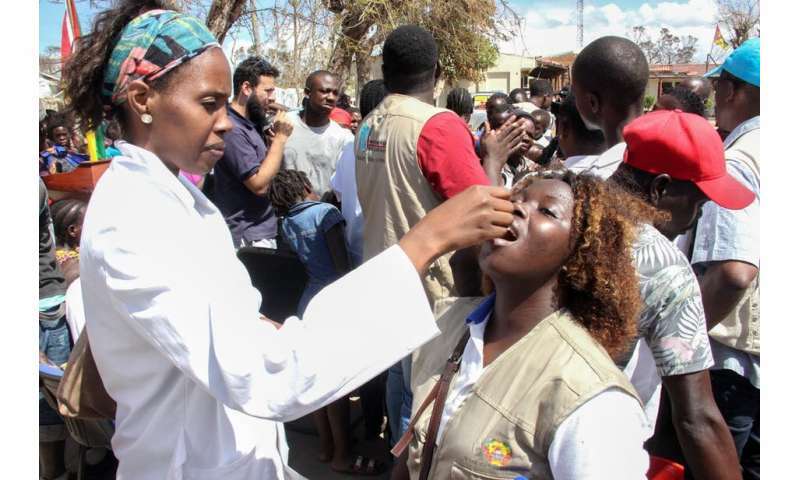 More than 800 000 people in four districts affected by the cyclone have received the cholera vaccine. A measles and polio vaccination campaign is also being planned. All these efforts are necessary and welcome. But it will also be crucial to look beyond the initial disaster response to ensure the countries that have been shattered by Cyclone Idai rebuild their infrastructure, and develop response plans to deal with future cyclone damage.